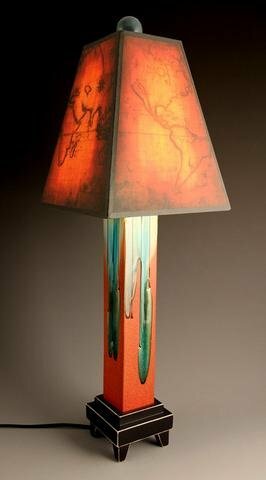 Rich colors and deep textures make this lamp exceptional. Made in Wisconsin by Michael Macone of Spooner Creek. Extruded clay lamp by Macone Clay features a melted glass surface (no two are exactly alike) and wood base. Measures approximately 22" high in total. Archival printed shade of a vintage map appears to glow, even when the light is off due to the vignette around the edge. The shade is 8" square at the bottom. A piece of functional art for the home.